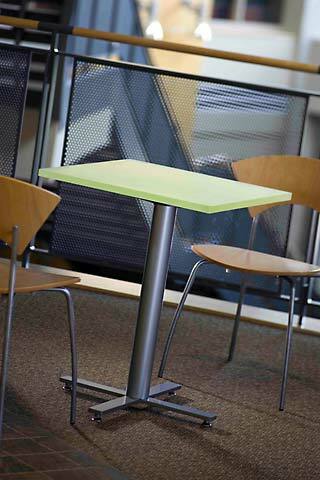 NeuCast© acrylic surfaces are suitable for dining, meeting, training, library, lounge, and many other applications. Available in all of Benjamin Moore® Preview and Classic colors, the color options are virtually limitless. • NeuCast© is offered in two versions: Solid NeuCast© and Fused NeuCast©. • Choose any color from Benjamin Moore® Preview or Classic collections. Light colors are strongly recommended over dark colors—they enhance NeuCast's© luminous quality and help hide fingerprints, etc. • Waterproof and non-porous, NeuCast© will not stain—making it ideal for cafés, restaurants, and corporate or university dining. • Durable acrylic surfaces will stand up to hard use. • Use NeuCast© tops with any Neudorfer wood or metal bases as well as on GEOS cylinder and cube tables.